This will be our last Introduction to Django post. Here, we’ll look at customizing the admin site. Next time, we’ll look at making our own Django app to help organize our grocery shopping list. Recall from Part 2 that we registered the Question model with admin.site.register(Question) within the polls/admin.py file. This allowed Django to automatically generate an admin site with a default form. The above change put the date published date before the question text. 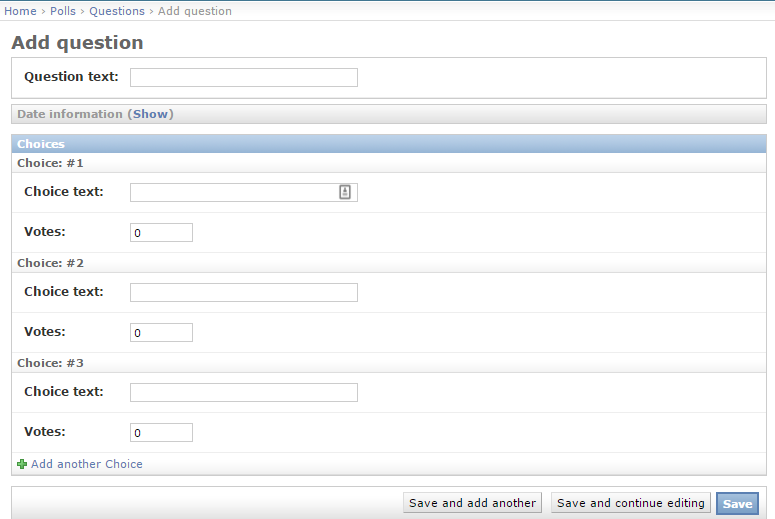 Our questions can have multiple choices, but the Question admin page doesn’t display them. We have a couple of ways to solve this. The dropdown contains all of our questions (for me, this is just “What’s up?”). We can add one choice at a time to each question. This is maybe better than how we were doing it before, but it would be much more efficient if we could add all of the choices when we add the actual question. This lets Django know that we want to edit the Choice objects when we edit the Question within the admin page, and it gives us enough room to add 3 choices (this is defined by the extra variable). Note that at the bottom of the Choices, you have the option to click a link to add more. Pretty cool! Maybe we want to see more information about each question such as the date published and if it was published recently. Note that we only told it to filter by the publication date. Django automatically knew that this datatype was a date type and added ‘Any Date’, ‘Today’, ‘Past 7 days’, etc. Navigate to the project directory (where your manage.py file is located) and add a templates directory there. For me, this is pantrio/templates. python -c "import django; print(django.__path__)"
Navigate to this directory. Then, go to contrib/admin/templates/admin and copy the base_site.html file. Paste this file into your own app/templates/admin directory (for me this is pantrio/templates/admin). That’s all for the Introduction to Django series. I still feel like there are many things I don’t quite understand, but I am excited to try to jump in and make my own app!